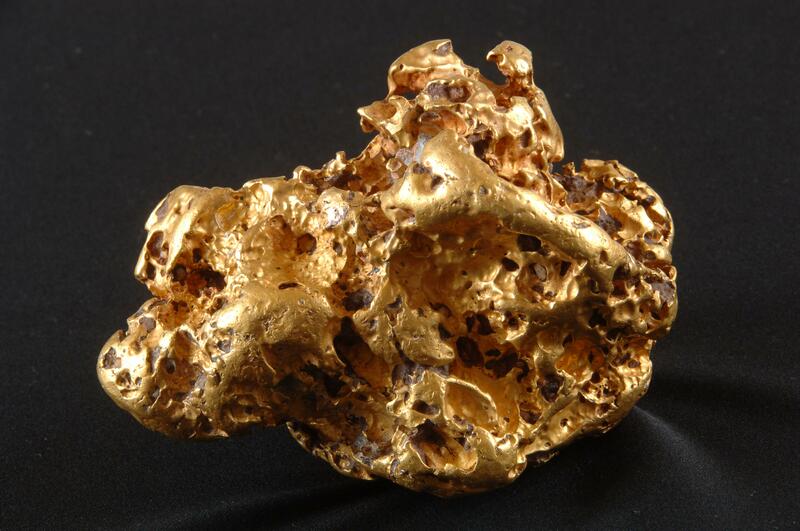 The Gold Museum is home to a large collection of gold nuggets of all shapes and sizes. Visitors frequently ask if the gold we have on display is real, and whether people are still digging it up in Ballarat today. We are pleased to reply that our gold collection is indeed genuine, and that most of the nuggets were found in surprisingly recent years, from the 1970s to the early 2000s. The Gold Museum’s largest existing nugget is the Goldasaurus, weighing 4.4 kg (141.17 troy ounces), which was discovered in Victoria at an undisclosed location in 2003. Following the recent discovery of the 3.6 kg Destiny Nugget, we decided to conduct some research to find out the history of the largest nuggets ever found, firstly in the state of Victoria, and then those that are still in existence worldwide. The majority of nuggets were found during the first three decades of the gold rush (1851-1879), and half of the top ten were found in Ballarat. Two were found by J.W. Gough, F.J. Sulley and J. Bristow on the Canadian Lead within two days of each other. 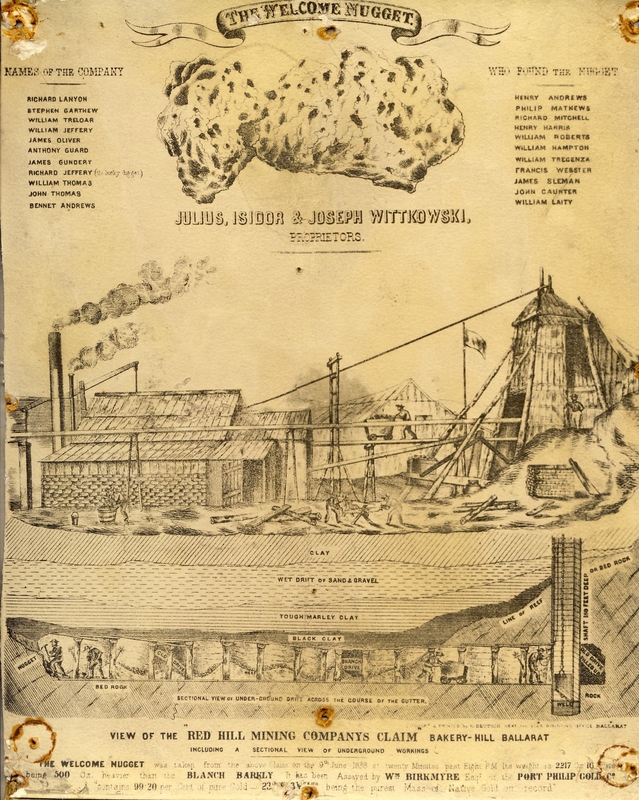 The Welcome Nugget was the largest discovered locally, by 22 miners at the Red Hill Gold Mine in 1858. Victoria’s largest nugget, the Welcome Stranger, also retains the record of being the largest nugget ever found in the world. There have been some claims that the so-called ‘Holtermann Nugget’ was the largest ever discovered in Australia. However, this find was actually a specimen rather than a nugget, and so it cannot be included on this list. The ‘Holtermann Nugget’ remains the world’s largest specimen of reef gold at 630 lb. (286 kg). We had previously worked on the understanding that the Hand of Faith was the largest nugget still in existence, but research has proved this to be incorrect. While the Hand of Faith is still the largest discovered by use of a metal detector, the Pepita Canaã of Brazil and the Great Triangle (aka the Big Triangle) of Russia are both much bigger. There may be other large nuggets in Brazil. Museum Victoria; Australian Gold, Gem and Treasure; Gold-net Australian Online; Victorian Department of Mines, ‘Memoirs of the geological survey of Victoria : no. 12. list of nuggets found in Victoria’ (1912); James Flett, The History of the Gold Discovery in Victoria, The Poppet Head Press: Melbourne (1979); Perth Mint. Leave a reply on "Researching the World’s Largest Nuggets"